Little Marvyn is only three years old. We just cannot figure out why he was dumped early in the morning at a meat auction in California. He is handsome and sweet and somebody has obviously put a lot of time into him to train him and work with this boy. He is just a lover, an easy keeper and moves our beautifully and does everything asked of him as he is eager to please. He lives at Skydog Malibu in a paddock with Chesney and they love running the hills together. 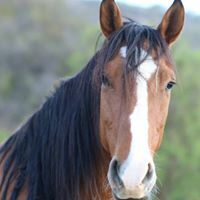 Of all the horses we have he deserves a forever home - when his quarantine is finished we shall look into finding him his person and if not he can stay with us and be loved on forever by our volunteers and visitors. Usually these horses have cheap rope halters on but Marvyn arrived in a nice looking turquoise halter so it makes us feel he was loved at one time and taken good care of.